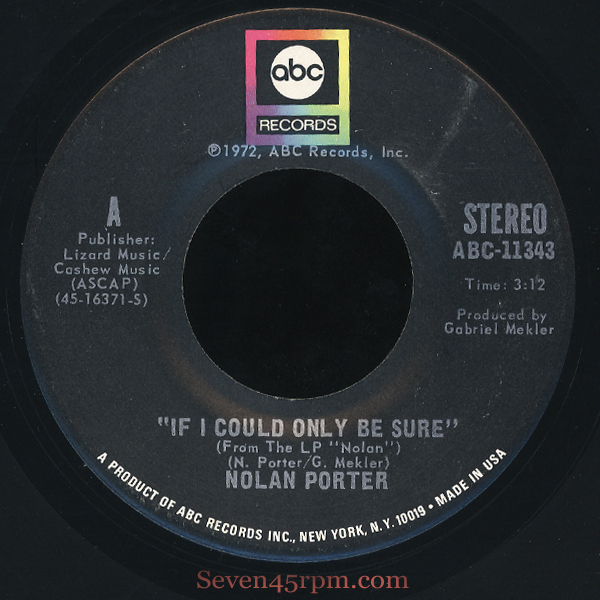 Nolan Porter’s If I Could Only Be Sure is one of my absolute favourite soul 45’s, and while it gets copiousness amounts of rotations around the house, that fervor it holds to me has never dwindled. But once again, it’s a little sad to discover that the man behind this big soul track, never really received the accolades he well and truly deserved! His discography is brief, recording only two albums and six singles in the early 1970’s. If you know and love this giant but gentle tune, you may also feel a little cheated, and wonder why we couldn’t have had more artistry from the beautifully voiced man! Well maybe we can. Nolan Frederick Porter was born 1949 in Los Angeles and started singing at around 12 years old, for local churches and choirs, and even in classical and madrigal styles. He believes he received his gift of singing from his mother, who had in fact auditioned for the Count Basie Orchestra at one time, but had to refuse due to her pregnancy. His musical “career” started when Porter meet Gabriel Mekler when he was performing alongside his sister in a classical group at the Los Angeles city college when he was around 19. She was keen for the two to meet, knowing with Porter’s voice, and her brother’s production knowledge, something great could come of it. Mekler was at the time producing some big bands like Blue Cheer, Steppenwolf and also Janis Joplin, and after Porter’s audition, the potential was evident for Mekler, who would spend the next year or two trying to help develop and adapt his vocal skills for the studio and the current scenes. His first recorded release was in fact an LP in 1970 called No Apologies, and was release on Gabriel Mekler’s Lizard label. It included a handful of pretty smooth covers, including a really nice version of Van Morrison’s Crazy Love. He also tries on with comfort Randy Newman’s Let’s Burn Down The Cornfield and Don Convay & the Good Timers great Iron Out The Rough Spot. Also appearing on the LP was the track Don’t Make Me Color My Black Face Blue, which would turn up as a flip on a particular big classic soul 45 the next year. The track Somebody’s Cryin’ would also show up as another 7” flip, this time to I Like What You Give, also in ‘71. Porter had some big session players by his side on this debut delight, including former members of Zappa’s Mothers Of Invention, Roy Estrada (bass), Jimmy Carl Black (drums), and Lowell George (guitar). Also sharing studio space with Nolan were members of Little Feat, Bill Payne and Ritchie Hayward, who were at the time supposedly working on their debut album (along with George and Estrada). Lowell George and Bill Payne contribute an original song called Somebody’s Gone. In August 1972, Porter returned to the studio to record his second album, simply titled Nolan, this time distributed on the ABC label, and again Porter was gifted with a handful of incredible session performers to lay down these tracks. Crossfire Publications lists Clarence McDonald (keyboards), Jim Gordon (drums), Ray Pohlman (bass), Larry Carlton (guitar), Ron Elliott (guitar), Charles Owens (sax), Oscar Brashear (trumpet), and The Blackberries (backing vocals) as the studio line-up. The album contained four new songs and re-recorded mixes of older songs such as Groovin (Out On Life), which was released on a Vulture 7″ the year before, with Porter under the alias of Federick II. This album also contains Porter’s best known song Keep On Keepin’ On, which was written by Richard Flowers, and it’s a huge tune likely more popular on the world wide soul scenes of today, rather than of the time. It had a single release on Lizard label in ’71, with Nolan credited as N.F. 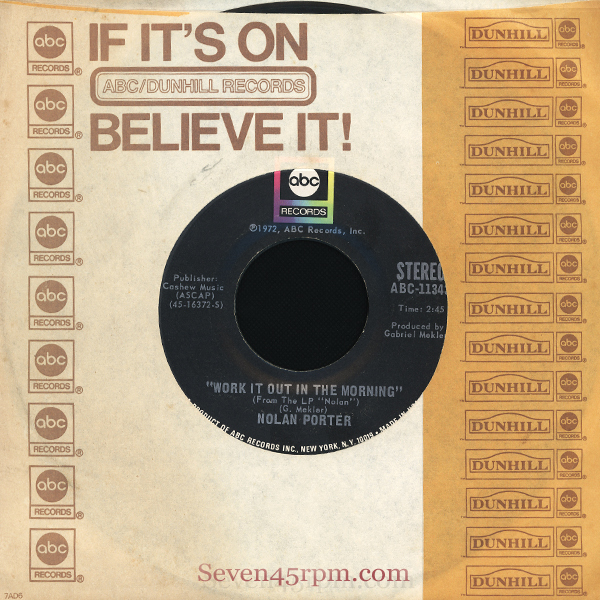 Porter, as a white promo label and with two red variations. Without any doubt If I Could Only Be Sure is the shining diamond of Porter’s catalogue, a composition of true genuine soul that has stood the test of time. One most notable player at these sessions was Johnny “Guitar” Watson, and when he plays Porter’s melodic guitar line, he threads the perfect foundation from the very beginning. The production breathes clearly, the keyboard has a minor but lustful distant howl, and Porters desirable voice sews all the components into a beautiful web of pure devotion. A simple progression with just a handful of poetic lines of love, like many of my favourite soul songs, it’s the simplicity that’s so astounding. The single was released on ABC then had a re-release on the subsidiary label Probe the year after in France, Japan, Brazil, and even Peru. All sharing the same flip with the Bryan Ferry sounding Work It Out In The Morning, quite a surprising jux’ed to the big soul sider! Porter was around 23 when If I Could Only be Sure hit the Top 100, and the prospect of a successful music career must have seemed inevitable. But by some cruel fate, the anchor holding his aspiration and hope, and Mekler’s record company, broke away, and that dream drifted away into a sea of disappointment. It’s evident that the implosion of the his good friends Lizard label was a complete debacle, and Porter, who generally found the whole business side of things too difficult to deal with at the best of times, found it all very discouraging. Mekler had licensed Nolan’s previous Lizard/Vulture recordings and his new Nolan Porter material to ABC, but ABC never signed Nolan Porter as an artist, although his recordings appeared on the label in 1972 and 1973. With alternate record divisions putting different songs under different labels and under different artist names, it was all just a calamity! With no intentions of suing helpful friends or playing any sly business games, Porter decided to depart the record business in 1974, but never got away from music. Porter returned to the studio in 1978 with the sessions producing the tracks, Bird Without A Song, Only A Thought Away, It’s Alright To Dream, City Lights, and a cover of Paul Simon’s Cloudy. He returned again to the studio in 1980, and re-recorded his 2nd LP cracker I Like What You Give, this time with a bit of a modern polish, but resulting with a more tame version than it’s predecessor. He also re-recorded Oh Baby, a new original titled Every Little Move, and also covered The Doobie Brothers’ What A Fool Believes, and quite nicely may I add. But alas, nothing eventuated with these recordings, and it would be two decades before he took another opportunity to record again. In 1999, Nolan was asked by co-producer Jeffery Ward to do a cover of Screamin’ Jay Hawkins’ I Put A Spell On You, or the film The Quickie, but after the film was completed in 2001, it went directly to DVD. Nolan has had a live and recording resurgence of late with contemporary soul group Stone Foundation to thank for. Founders and Porter fans Neil Jones and Neil Sheasby, were able to track their legend down around 2010 and grouped together for a show. A tour followed from the north to the south of England in 2012, and in between, the band even shared some beneficial time in the recording studios. The outcome was a pressed 7” titled Tracing Paper (Heavy Soul ROR015HS3), a duet in fact with singer Neil Jones, who I’m sure must have been pinching himself more than a few times throughout that session. A follow up single in 2013 followed, this time resulting with a tight and snappy reworking of Porter’s Fe Fi Fo Fum (Heavy Soul ROR044), taken from his No Apologies Lp. Nolan and the “foundations” also recorded a very cool and moody track titled The Right Track, which was apparently featured in a detective show, but I couldn’t track down the details (my detective skills failing here) but I’m almost certain it had no official vinyl release. In 1999 Nolan Porter met Patrice, and by coincidence, little sister to Frank Zappa, and as Porter quotes, a “far better” R & B singer than himself. The couple fell in love and married, and now sing together. Porter never had the opportunity to meet Frank himself, even back when key members of the Mothers Of Invention were hired to record on his debut LP, but he does feel close to him and holds him tight with the strong family bond. Today Porter is still both excited and surprised to discover that today’s soul scene holds him in such high regard, and that his tunes are been danced to all over the globe. But it is us that should be truly grateful! Gabriel Mekler passed away in September 1977, leaving the entire Lizard/Vulture catalogue unguarded. This has led to numerous unauthorized and/or unlicensed releases of Nolan Porter’s material. This entry was posted on July 20, 2016 by seven45rpm. It was filed under Cool Cats, Funk, Soul and was tagged with ABCRecords11343, FederickII, frankZappa, GabrielMekler, IPutASpellOnYou, JohnnyGuitarWatson, Lizardrecords, MothersOfInvention, NolanPorter, ScreaminJayHawkins, StoneFoundation, Zappa.